I had the date wrong! I thought the Rocky Peak 50K was the Saturday following the Skyline to the Sea trail marathon and had decided I wouldn’t be able to run it. When I got back from Santa Cruz I checked some upcoming races on UltraSignup and discovered Rocky Peak was on October 20th, rather than the 13th. That meant there would be 12 days between the races, instead of 5. Five days or 12, my legs weren’t quite on board with the idea, and they had a point. With about 6000′ of elevation gain/loss, steep ups and downs, and rocky roads and trails, Rocky Peak is not an easy 50K. I had a few more days to convince them, and hoped my legs would come around. It did help that the Start line is about 10 minutes from my front door. I’ve hiked, run and explored the Rocky Peak area for more years than I care to admit, and was very excited when Randy & Sarita Shoemaker organized the first Bandit Trail Run in 2009. 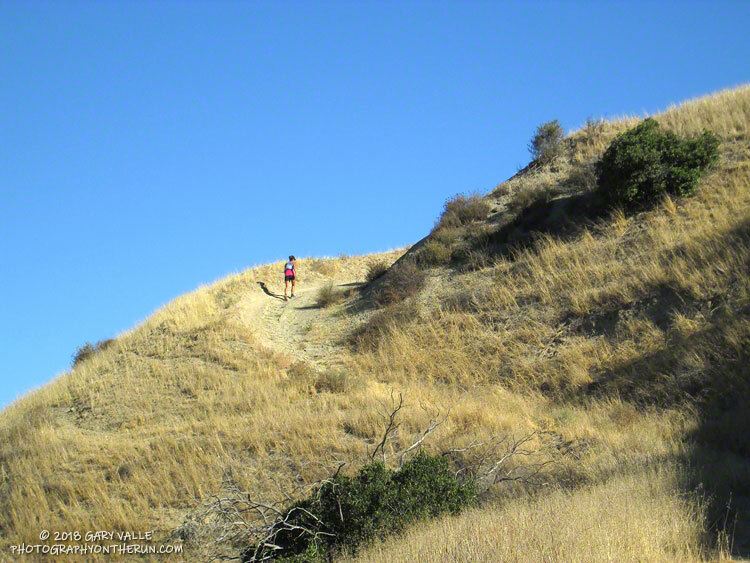 The 50K was added in 2011 — the additional mileage gained by doing the Chumash – Las Llajas loop twice! The out and back to Tapo Canyon was substituted for the second loop in 2013. The Rocky Peak 50K course is essentially the same as the 2013 – 2016 Bandit 50K courses. The week before the race I still had to go through the pretense of not knowing if I was going to enter. My legs continued to complain on training runs, and it looked like yet another heatwave was going to peak on Friday or Saturday. None of that really mattered, because at a key level, I’d already decided I was going to run. Thursday I signed up, and at dawn on Saturday I toed the Start line in Corriganville, hoping that Rin Tin Tin might come to my rescue. I encountered no valiant German Shepherds on the “warm-up loop” around Corriganville, and much to my leg’s chagrin soon faced the mile-long, 860 foot climb up the Corridor Trail to Rocky Peak Road. One of my main takeaways from doing this course many times is that you can go up the Corridor Trail climb too fast, but it’s almost impossible to do it too slow. At least that’s what my legs tell me. It’s been my experience that going a little slower on this first steep climb pays significant dividends later in the run. That seemed to be the case again this year. The weather was nearly identical to last year’s race with moderate Santa Ana winds and warm temps. (The high at the bottom of the Chumash Trail was 88 °F.) Like last year, the low humidity and wind kept the “feels like” temperature relatively comfortable for most of the race. But somewhere around mile 27, near Rocky Peak, the wind stopped and things got toasty. Maybe not middle of the summer, Mt. Disappointment hot, but warm enough to notice it. All in all the run went well. For sure, my legs were a little tired from Skyline to the Sea. I was a bit slower running back up the canyon from the Tapo turnaround and also going up Las Llajas Canyon. But I can’t complain. I had no cramping (yahoo!) and felt good nearly all of the run. Many thanks to Trail Run Events, LLC and New Basin Blues Running Club who co-managed the race, all the volunteers, and to Ventura County SAR. For more information see the Trail Run Events web site and Facebook page. All the 50K and 30K results are posted on UltraSignup.